Controlling pump flow and pressure had commonly been done via throttle control valves. Closing the valve would reduce flow but the motor still ran at 100%. So your energy cost remained almost constant. By adding a variable frequency drive to the system, we can vary flow by reducing motor and pump rpm. This allows you to eliminate the inefficiencies associated with valve. By slowing down or speeding up the motor with the VFD you control the flow of the pump. You save energy by running the motor and pump at a percentage of full speed. Many manufacturers (Baldor, Reliance, Yaskawa) include an internal PID(proportianal-integral-derivative) controller. Linked to pressure sensors, these can program your vfd and motor to automatically adjust speed to maintain pressure at your desired setting. 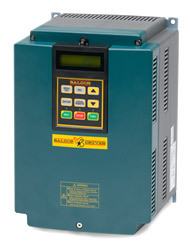 Baldor Electric makes an economical line of VFDs designed especially for pumps and fans. Finally, variable speed drives let you slowly ramp up the speed of the motor and pump minimizing in-rush currents. This will help you eliminate those peak demand charges the electric companies are adding these days. This also help reducer water hammer and shock to the mechanical components.